Parents with younger children should get 20-min free slots to visit art galleries. Or not so much galleries, as a couple of the interesting things inside them. That’s my brilliant thought for the weekend, having quickly visited the Tate Modern with a friend and his two boys, aged six (very nearly 7) and 4. My friend was sensibly anxious about how his boys would behave – the youngest being lured out on the promise of buying ‘cars’, rather than meeting up with his dad’s university friends. After an appealing ‘that’s awesome’ reaction to the massive, huge, enormous, what colour is it?, red installation in the turbine hall, we needed a quick hit. 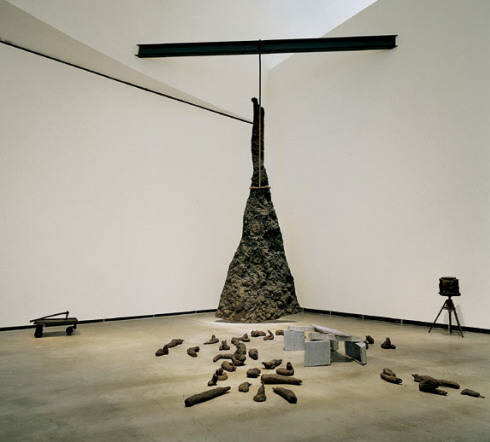 I suggested Joseph Beuys ‘Lightning with Stag in its Glare’ as the biggest other ‘thing’ I could think of. Success. It was ‘a mountain, with big piles of clay poo at the bottom’. That’s a definition you can’t argue with. Though it is ‘more’ than that, it is that to a six-year-old (and who can deny the poo similarity, whatever age?). He showed polite interest in the news that that the ‘clay’ was, in fact, bronze. We decided to save the wonder of alloys for another day. Wandering into the next room, I went for the ‘what’s the best picture in here?’ gambit. Did he point at the nearest, or the best? Who knows, or cares. It was surrealist/abstract, called something to do with childhood dreams, and it was by someone I’d never heard of. What appealed about the painting? ‘It is artificial.’ Interesting… We then spent a minute spotting the faces hidden in the painting – ‘ooh, I wonder, what’s that white shape there..?’ I mused. ‘Oh, do you mean the hand shape? I think that’s a hand.’ I felt excited when I spotted the cat. Then it was ‘that’s by Picasso he was from Spain’ (They can learn artists like dinosaurs I reckon). 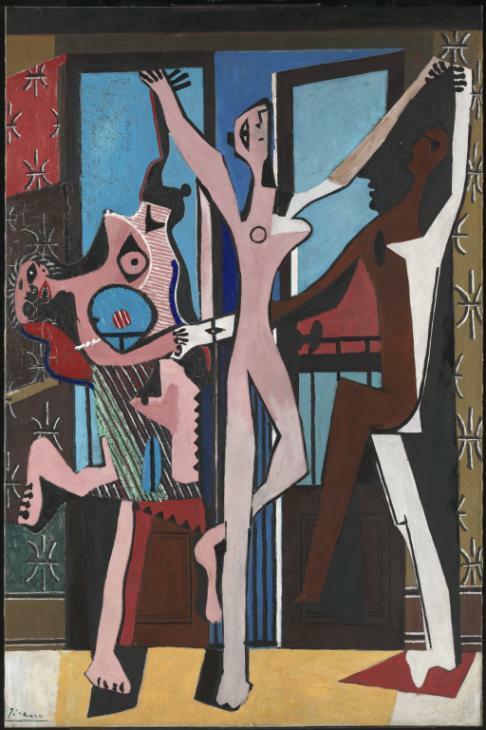 And yes it was, Picasso’s Three Dancers. There’s one lady dancing, another lady sitting with her neck like this – demonstration – and another one just standing on one leg. I had to guide fingers back from the picture at one point, but it was good to stand very close and look very hard at the black line that marks the bottom of the doors, and I realised, really gives the impression that there is something behind them. And that was it. After less than half an hour, we were all heading for exit, hugs and must -speak-soons. Smaller children can ‘appreciate’ art – on their terms. Wailing toddlers being pushed or dragged round the ‘big exhibitions’, frazzling themselves, their culture-starved parents and everybody else who has paid, are probably having less fun, and being less enlightened, than they would be in a supermarket. So, give them just a little while to look at one or two pictures, and ask them what they think. The great thing about art is that there are no wrong answers, just lots of chances to describe what you can see. And the ‘maintaining cadence with ms’ message in this? It reminds me that all the little bits are worth it. I was no more up for a two-hour gallery tour than those little boys, flagging after a fun morning of walking and talking. I really, really enjoyed looking properly at those three things. So if I need to take on the Tate a bite at a time, so be it. 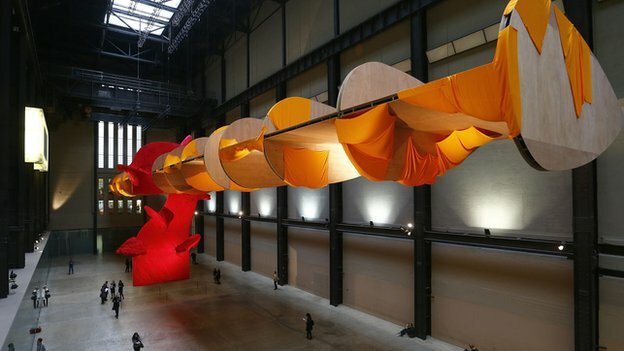 The ‘awesome’ sculpture by US artist Richard Tuttle in the Tate Modern turbine hall.